It supports faster input polling than Unity's Update() loop which may be desirable for using input in physics update. XInput support for InControl is disabled by default. 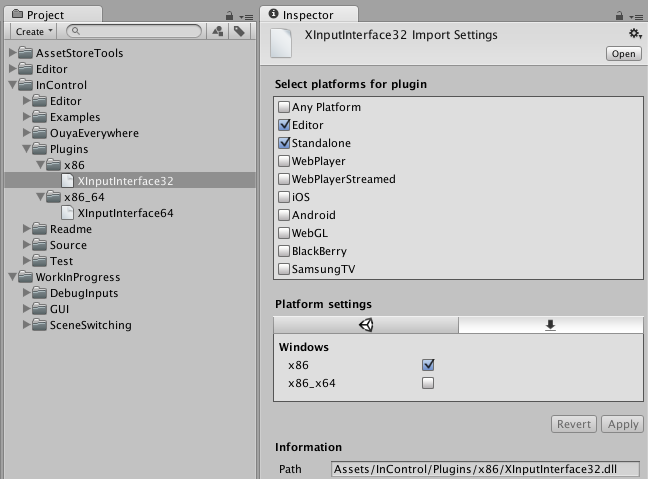 To enable it check the option in the InControlManager component inspector. 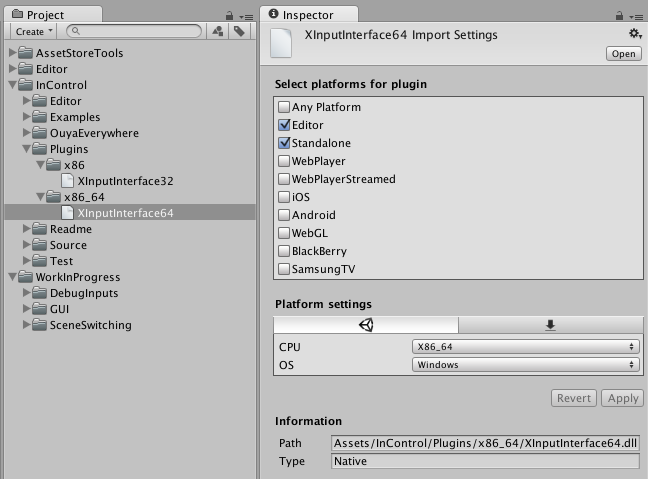 To use XInput with Unity 4, follow the instructions for using XInput.NET. Essentially, place XInputInterface32.dll or XInputInterface64.dll next to your .exe file and in the root of your Unity project (for running in the Unity Editor). Make sure you are using the correct DLL build for your architecture. Some have had a problem with the version(s) included with InControl, although in recent releases both versions are included in the asset and renamed accordingly. If you wish, you can grab the latest builds directly from the XInput.NET project releases page. You will also need to ensure you have DirectX installed, and in particular XInput1_3.dll is required. On some versions of Windows, the version of DirectX installed by default is too old, so make sure you upgrade DirectX if you're having problems. There are two advanced settings when XInput is enabled: Update Rate and Buffer Size. In almost all cases you'll want to leave both as 0 which lets InControl determine sensible defaults. For performance efficiency, InControl polls XInput state on a background thread. The Update Rate determines how often this polling occurs. It defaults to using the fixed update rate. The Buffer Size determines how many state snapshots the background thread hangs onto in a ring buffer. In some cases when using input in physics steps it may be desirable to use a small buffer as Unity calls several fixed updates bunched up at the end of a standard update instead of spreading them out smoothly over each frame. The buffer set to the approximate size of these bunches allows for smoother input values over these fixed updates at the expense of a tiny amount of latency. This is mostly an experimental setting and is best left disabled (which is the default) unless you truly understand and care about it what it does.